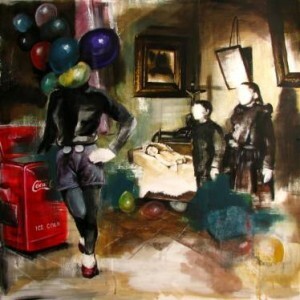 Stefan Doru Moscu is an emerging artist living and working in Brasov, Romania. He received a B.A. 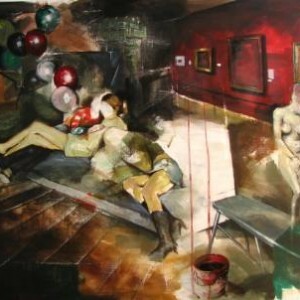 in Art and Restoration from the State University of Sibiu, Romania and works with both painting and sculpture. Stefan’s surreal paintings explore society’s transformation from the past to the present. He culls inspiration from decaying objects, old photographs, pop culture, and art history to present a critical view of various social, political, and cultural issues. 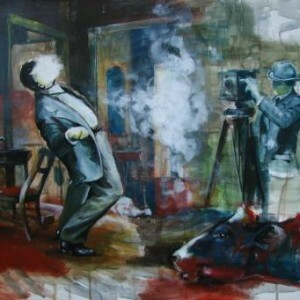 His works are characterized by a darker color palette and obscured figures, giving his compositions a more somber mood. 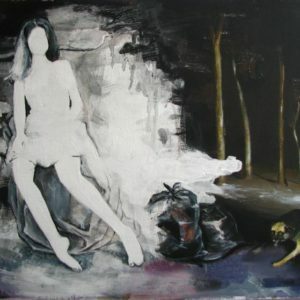 Stefan had an artist’s residency at Glo’Art in Belgium in spring 2015 and has exhibited his works in the US and across Europe in countries including Romania, Germany, Belgium, and Poland. Most recently, his works were a part of The Sea/Das Meer international group exhibition at Group Global 3000’s Projectspace in Berlin and the Mosaique de l’arc-en-ciel project in Bucharest. 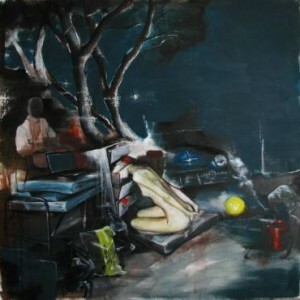 The transformation of society between the “online and offline” of the immediate past and the present is my main focus. I take inspiration from textures like those of objects degrading, decaying, rusting, or corroding over time. The complex structure of the combination of broad brushstrokes with specific colors (blues grays, browns, and greens) assumes extreme importance in the artwork, taking a critical view of social, political, and cultural issues by suggesting a somber, furtive, and enigmatic mood. I try to expose a contemporary vision of major political narratives and fundamental, universal topics such as the abuse of power, exploitation and oppression, and also of a personal, individual human struggle. In my research as an artist, I intend to deconstruct reality, fairy tales, old photos that depict childhood, and adult culture, in a discourse that challenges existing political, economical, social, and technological paradigms. Last but not least, I intend to explore the relationship between man and nature in urban environments in an attempt to obscure historical and political references with personal memories, film references and scenes from the entertainment industry, and elements from art history. My wife always says, “Take your work seriously, but don’t take yourself too seriously,” and I think this is the best advice to follow. Sometimes my moods are unpredictable, and I do like listening to music in my studio, but I realized that, lately, silence helps me get a closer connection with what I paint. I would like to have one of the illustrations made by Gustave Doré for Dante’s Divine Comedy. It just fascinates me. It’s a hard question for me, because I have so many favorite writers… I must say that my top favorites are Dostoevsky, Mikhail Bulgakov, Thomas Mann, Goethe, Patrick Suskind, Alain de Botton, Thomas Pynchon, Hose Saramago, Henry Miller, Jack Kerouac, Ian McEwan, Ernest Hemingway, Oliver Sacks, and many others.